Your Clients Are Getting Older. So What? The risk to financial planners of aging clients may be overstated if you look at mortality numbers and do the math on safe withdrawal rates. In recent years, an increasing number of practice management consultants have begun to sound the alarm on the dangers of having an aging, retiree-centric client base in a financial planning firm. As the logic goes, retired clients are depleting their portfolios with ongoing withdrawals, and more and more will pass away as the years go by, so a planning firm with aging clients is akin to a rapidly depreciating asset. However, a deeper look at the numbers reveals that these drawdowns in client assets may be overstated, at least in the coming decade. After all, the reality is that at a 4% safe withdrawal rate, a balanced portfolio should still be able to grow for years to come, and there’s actually a 96% chance that clients will still have all of their nominal principal left even after 30 years. Similarly, while the mortality rate is higher as clients age, the reality is that out of 100 client couples aged 65, the statistics suggest that 90% of them will still be around in 15 years. Of course, the caveat to working with retirees is that, compared to accumulator clients, the mere fact that they’re spending and not saving with ongoing contributions is still a headwind, and obviously even the modest attrition rate for early retirees is still higher than what it would be for younger clients. Nonetheless, these statistics suggest that firms simply worried about retaining value in the coming years should perhaps focus less on catering to the next generation to reduce the average age of clients (especially if those clients can’t be served profitably by the firm in the first place), and more on retaining the current generation, especially by building relationships with both members of a couple to increase the likelihood of retaining a surviving widow. While the demographics of an aging client base will eventually be more of a challenge, the real impact is still many, many years away, and simply focusing on retaining widows (or not) of the current generation may matter most of all in the coming years! How Much Do Clients Really WIthdraw in Retirement? For an advisory firm that’s built around the assets-under-management business model, it’s proper to be concerned about having clients who are retired and taking withdrawals from their asset base since that constitutes a headwind to growth and sustainability. Yet the reality is that relative to the asset base itself—and the prospective growth of markets—ongoing retirement withdrawals are not likely to deplete assets significantly. In fact, the withdrawals may not deplete assets at all for years to come. The reason that retirement withdrawals are not all that destructive is the simple fact that in the early stages of retirement, withdrawals relative to total assets tend to be rather modest. 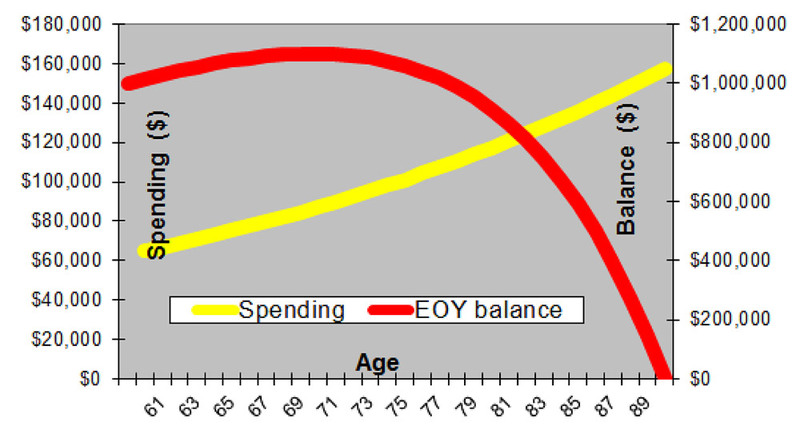 For instance, the chart below shows how rising spending (yellow line) impacts a retirement account balance (red line) over time, assuming an 8% growth rate on a balanced portfolio, and an initial withdrawal rate of 6.6% that rises each subsequent year for inflation (i.e., $66,000 withdrawal in year one on a $1 million portfolio, and the $66,000 withdrawal amount is increased in each subsequent year for inflation). As the numbers show, and as evidenced by the fact that withdrawals start at a rate (6.6%) that is less than the growth rate (8%) on average a retiree at age 60 doesn’t actually begin to deplete the account balance at all until almost halfway through retirement. It’s only by the client’s mid-70s that the account balance even begins to decline, and several more years after that before it dips below where it started, and only then finally experiencing the rapid spend-down in the later years. Of course, the caveat to the chart above is that portfolios that average 8% don’t necessarily earn it every year, and not every retired client dies “promptly” on their 90th birthday; some live longer. As a result, even assuming an average growth rate of 8% on a balanced portfolio, clients are not recommended to spend the 6.6% initial withdrawal rate that “works” based on the above straight-line projection. Instead, the standard safe withdrawal rate is actually 4%, to defend against such unfavorable sequences, unexpectedly longevity, etc. Yet in turn, it’s important to bear in mind that when balanced portfolios average 8% and the withdrawal rate starts at only 4%, in the overwhelming majority of scenarios, clients will simply outearn their spending level, sometimes quite dramatically. Moreover, wealth is more likely to compound upwards than spend down at all. In fact, as Bill Bengen’s original safe withdrawal rate research showed, in 96% of historical scenarios a 4% withdrawal rate finishes with at least as much nominal principal at the end of 30 years that it started with; in the median outcome, clients following a 4% safe withdrawal rate approach actually more than quadruple their wealth over their retirement time horizon! Which means that ultimately, there is actually very little danger that ongoing retirement withdrawals will totally deplete a retiree’s asset base. Even if it does, it’s not likely to happen until the very last years at the end of retirement as clients move into their 80s and beyond. Notably, while some consultants caution about the impact once clients reach age 70 ½ and begin required minimum distributions from traditional IRAs, the reality is that if clients don’t actually need to spend the money. An RMD is simply a transfer from an IRA to a taxable account that doesn’t necessary change the available assets to manage, beyond perhaps the portion attributable to income taxes that may be payable from the investment assets. In part two of this posting, I’ll take a look at another perhaps surprising finding about retirement: the survival rate of married couples.